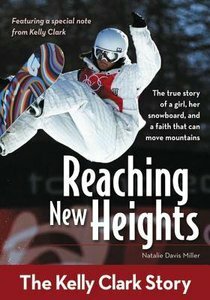 Reaching New Heights Snowboarder and Olympic Gold Medalist Kelly Clark had accomplished her life's goals by the age of 18. Yet, success didn't leave her feeling fulfilled. Two years later, at an event in Salt Lake City, Kelly stood at the bottom of the pipe, listening to one snowboarder console another who had just crashed: 'It's alright. God still loves you.' These words led Kelly on a new journey from an Olympian snowboarder into an awesome relationship with Jesus. This story of one of the world's greatest snowboarders will encourage readers young and old to reach for the next level, knowing that God will be with them, win or lose. Natalie Miller has been a professional ventriloquist for more than 20 years, performing for both mainstream and Christian audiences. In 2004 she followed her heart and went into full-time ministry and now tours full time throughout Australia and NZ and the USA with her puppet pals. Her vibrant Sally Squad show is highly successful making her a popular guest speaker and concert performer in schools, churches and conferences world-wide.